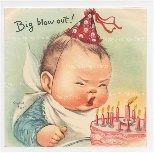 The Vintage Greeting Card Images CD Volume 3 contains Patty's album. She was born in 1947 and was probably a first child. Her mother saved all the cards she received in her first few years. 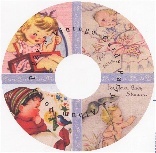 This CD contains 156 cards with 409 graphic images. It contains Shower, New Baby, Birthday, Easter, Valentines and Christmas. The cards on this CD date from 1947 to 1951.